The Nautilus Annual Calendar with Moon Phase ref. 5726/1A-014 stays true to the iconic DNA of the Nautilus line while featuring one of our favorite complications, the annual calendar with moon phase. The annual calendar differs from the perpetual calendar in that it does not take into account the additional day that is added to the month of February in leap years —every four years. This is however, a complication that calculates odd and even months and also factors in the 31st day of August. In a nutshell, it is a useful function that avoids the wearer having to adjust his watch every month. The blue dial features white gold applied markers with luminescent material and the iconic horizontal grooves on its surface. The new blue dial maintains the same layout with the double day/month apertures at 12 o'clock and moon phases indicator at 6 o'clock with overlapping 24-hour indicator and date aperture at the bottom. 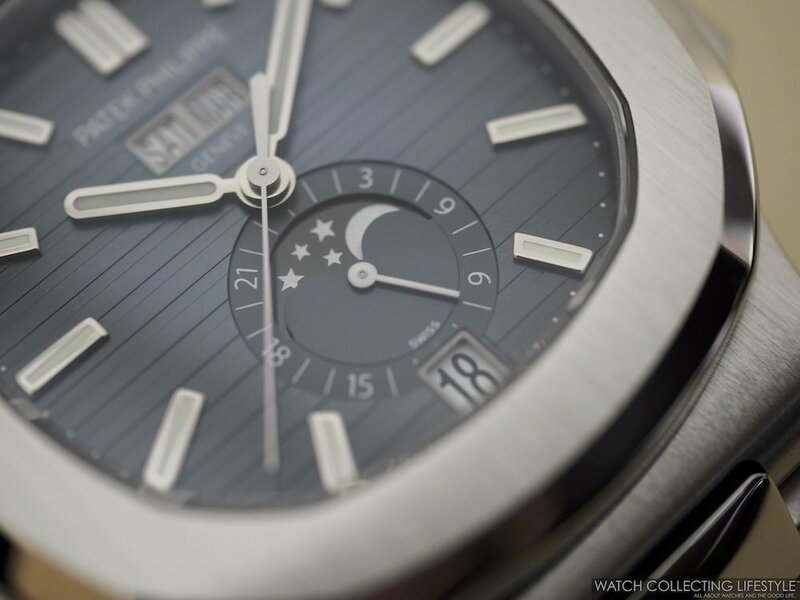 A perfect combination that makes the the moon phase indicator pop-out even more. Fitted with a stainless steel case measuring 40.5 mm in diameter its solid and robust case —just like a porthole—, maintains all aspects of the original Nautilus DNA uncompromised and unaltered. The case band features four correctors to ease the adjustment of the calendar and moon phase functions. The case and bezel, true to its essence, features contrasting high polished and satin brushed finished areas. The Nautilus Annual Calendar with Moon Phase ref. 5726/1A-014 is powered by the automatic Patek Philippe calibre 324 S QA LU 24H/303 composed of 347 parts, 34 jewels, 10 bridges and which provides a power reserve of 45 hours while beating at a frequency of 28,800 vph. The display case back allows for full view of the calibre and the watch is water resistant to a depth of 120 meters. On the wrist, the new Patek Philippe Nautilus reference 5726/1A-014 wears true to its size and with unparalleled wrist presence. While we loved the grey and white dial versions, there’s something very special about the blue dial that makes the 5726 even better. The 5726 is now only available on stainless steel bracelet with blue dial and on alligator with black grey dial. The Patek Philippe ref. 5726/1A-001 with black —grey— dial and ref. 5726/1A-010 with white dial were officially retired about a month ago and replaced by this new watch. Sticker Price $45,928 USD. For more info on Patek click here.